Thomas Tuchel won his first Revierderby as his Dortmund side put 3 past a poorly-organised Schalke defence. His side were structured well to exploit the deficiencies of a man-oriented 4-4-2 shape, particularly through their deep playmaking. Dortmund’s narrow formation against Schalke’s more-orthodox 4-4-2. Tuchel made little surprise in his selection as he presented a fairly standard XI in a narrow 4-2-3-1 formation. Roman Burki was the goalkeeper with an unchanged defensive line in front of him. Julian Weigl was ever-excellent as the deepest midfielder and was joined by Ilkay Gundogan to form what is becoming a great partnership. Shinji Kagawa joined the pair frequently from a slightly higher position as the Japanese midfielder played with more focus on the development of possession in deeper spaces. With Kagawa moving deeper, Mkhitaryan and Castro were more centrally-oriented as the two combined well with Aubameyang ahead of them. Schalke took on a 4-4-2 shape with young attacker Leroy Sané alongside Klaas-Jan Huntelaar in attack. Di Santo and Max Meyer were positioned on the wings with Kolasinac and Goretxa forming the centre of midfield. Lining up in a 4-4-2 shape, Schalke’s structure was just as common a 6-2-2 due to the man-marking responsibilities of the wide players. 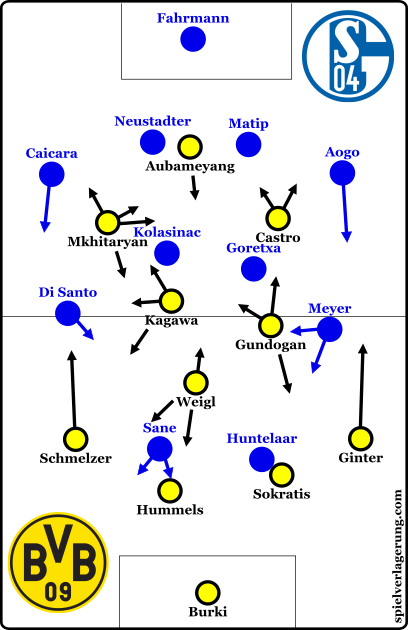 Both Di Santo and Meyer man-marked Schmelzer and Ginter respectively and due to the agressive positioning of the full-backs, they often formed a 6-chain in the defensive line. Schalke struggled to cover the necessary space due to their man-marking. Immediately this caused defensive instabilities across the shape, not just in wide areas, as they lacked presence of the central spaces with just Kolasinac and Goretxa present. Such issues were then emphasised through poor spacing of the central midfielders. Already they struggled to occupy enough space due to the absent wingers, but were often positioned too closely together and thus the half-spaces opened as shown above. The narrow shape can be seen in the build-up to the first goal of the game. Julian Weigl has attracted the attention of 3 Schalke pressers in the centre of the pitch and collapses the midfield in the middle, similar to the basketball tactics of opening up a perimeter shot. With Schalke’s narrow shape, they have no presence in the right half-space leaving Mkhitaryan completely free. Now in possession, he drifts towards the right touchline and opens up space for Ginter to drive into through the right half-space who receives a Castro through ball and crosses for Kagawa. Schalke’s midfield is extremely narrow meaning that when the ball is moved into the half-space, defensive issues arise. The strikers had similar spacing issues which caused multiple problems for their pressing game. With Sané and Huntelaar often quite close together during central ball possession, they commonly lost access once the ball moved into a wider position whilst they were slow to recover from there. This was less of an issue through the second half, though as a result of Dortmund’s actions. Marcel Schmelzer took on a less aggressive position during their build-up meaning that Di Santo was no longer in the defensive line and could provide positional support to Kolasinac. In Schalke’s third however, the issues returned as Schmelzer again pushed on as he has done all season. 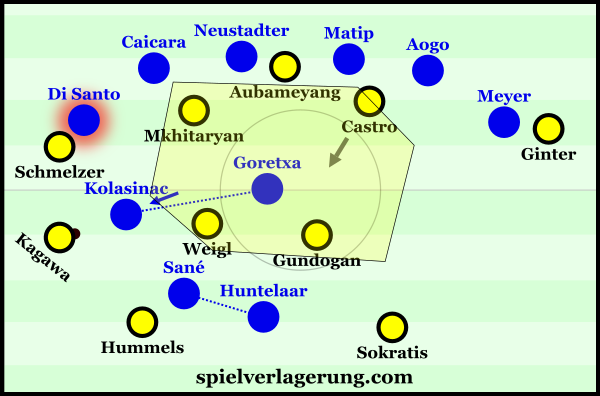 There were some slight adaptations of the building game of Dortmund which worked well against Schalke’s 6-2-2 formation. With Schmelzer and Ginter particularly high, Kagawa acted in deeper spaces to create what was more a 2-3-4-1 shape. The ‘3’ of Kagawa, Weigl and Gundogan were integral to the development of possession as their playmaking abilities alongside Hummels opened the centre well. Dortmund’s 3-chain was very effective in breaking through Schalke’s centre. Dortmund were again focused on build-up through the half-spaces with a particular interest down the left where Kagawa was moving into. 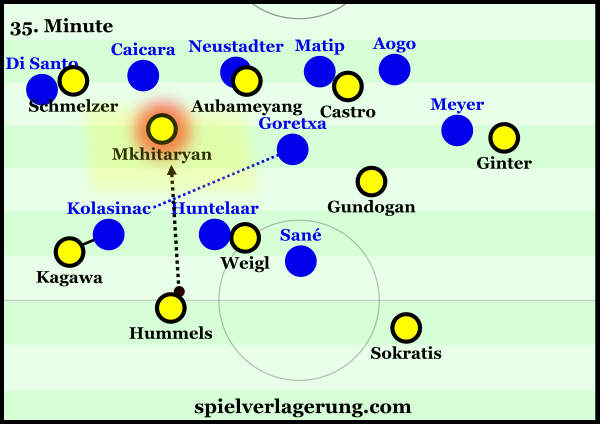 Although Mkhitaryan and Castro were oriented slightly higher than in the usual system, the structure was still fairly strong and allowed for combinations through these spaces. 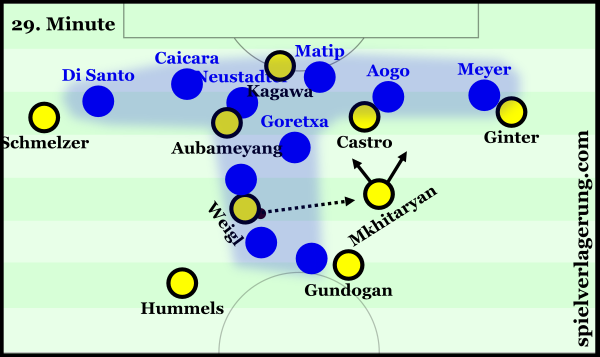 From the left and right half-spaces respectively, Kagawa and Gundogan were both diagonally-oriented in their passing as BVB looked to make the most of Schalke’s central instability. Their positioning supported this orientation as they had a good field of view over the centre and opposite half-space. For more, read RM’s words on the diagonality of the half-spaces in his tactical theory piece. Although this wasn’t a tactical variation of Tuchel as his side are oriented quite heavily on these spaces usually, the strategy was particularly effective against the defensive shape of Schalke. With both wingers man-marking their full-back, they were very disengaged from the battle inside and couldn’t support their near CM. Thus, Dortmund could build attacks around an isolated Schalke CM which could also emphasise the dribbling ability of Gundogan and Kagawa. Schalke’s 6-1-3 had a very open centre against Dortmund’s building structure. The ‘2-3’ of the structure outnumbered Schalke’s press quite easily allowing for a generally clean progression past Sané and Huntelaar, then forcing a central midfielder to push out and forcing a very unstable 6-1-3 shape from their opposition. During these moments, the centre was opened well for Dortmund to move the ball back inside against the now-isolated ball-far Schalke CM. When possession was with Dortmund’s centre-back 2-chain, the structure was used to open passing lanes for Mats Hummels to use. The German’s playmaking abilities has been a key factor in Dortmund’s possession game this year as he breaks the lines of pressure well. An example of this came in the 35th minute where Kagawa had drifted towards the touchline and brought Kolasinac with him. Hummels received the pass and was briefly without pressure as Huntelaar was hesitant to press as he was marking Weigl. A passing lane was opened between the Dutch striker and his teammate in central midfield whilst Mkhitaryan dropped in to receive in masses of space as Goretxa was completely isolated between the 1st and 3rd line. A scene from the 35th minute of the game. One criticism could be made of the frequency that Dortmund were able to exploit the centre following the initial progression. I feel that this could’ve been improved had the orientation of Castro been less vertical as the German was more often against the Schalke defensive line. If he had dropped into the centre more, then Dortmund would potentially have been able to form more developed attacks with better possibility for overloads and combinations around Goretxa. At the beginning of the season, Dortmund were heavily focused down the left half of the pitch however that has changed somewhat as they are more open to right-sided attacks too now. Likely for the sake of strategical variability, as well as the brilliance of Gundogan and Ginter’s form, it is more common now to see Tuchel’s side build down the right as opposed to the first few matches. During these moments, both Kagawa and Mkhitaryan could be seen situationally drifting across in such long-range movements. Through doing so, they offer for connections à la the left-sided developments as well as creating potential for local overloads to be formed. 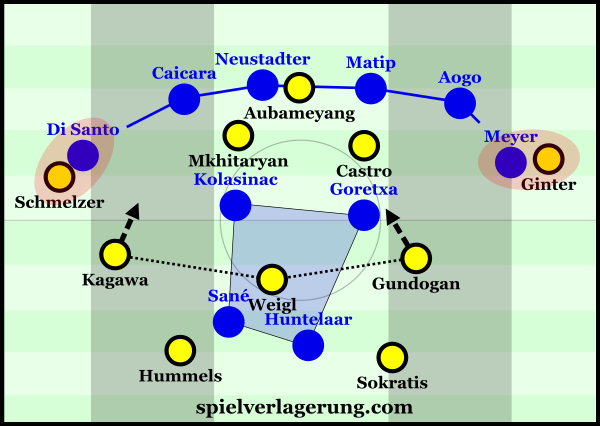 Mkhitaryan had a crucial involvement in the development of the first goal, as the Armenian drifted over to the right half-space to support Castro and Ginter before the latter was freed to cross for Shinji who racked his first derby goal since 2010. After another Dortmund mistake gifted Huntelaar his second of the afternoon, Dortmund quickly shifted to a more stability-oriented possession game. Their circulation of the ball immediately became more patient and horizontal whilst Kagawa maintained his deep positioning and himself was less vertically-inclined. From the 75th minute onwards, Dortmund were relatively content to pass it across a back-line which often consisted of 3-4 players and would only advance when they could do so with stability. In Tuchel’s short time in Dortmund, they have become a very aggressive team in possession and this was a rare case of them playing defensively in possession as they looked to take the sting out of a Schalke attack by restricting them of the ball. Despite this, they still looked strong on the ball and through the first and second lines made some strong circulation. With greater patience, they actually improved at opening spaces in the centre as not only did they force Schalke to press higher, but had a cleaner initial progression which supported the actions following. Although they didn’t create many great chances during the later period of the game, possibly from their hesitancy considering the game state, their slower possession game showed potential to be effective with strong positional play. The match was a good example of the issues of man-marking as Tuchel adapted his side to take advantage of Schalke’s defensive organisation. Aside from the structural issues caused, the build-up to Kagawa’s goal showcased it on an individual level as some simple movement allowed Ginter to become free. When a marker is following his man, he can only anticipate what the attacker will do next and will always be slightly behind in reaction which is what caused Meyer to lose Ginter before his cross. Although the score-line suggests a tighter match, Tuchel was not short of replicating the dominant 3-0 win of last season (I guess there’s only so much you can do without Oliver Kirch). Dortmund have shown that they are clearly the 2nd best team in Germany again yet it is a shame that a team playing to such a high standard will have such a small chance of winning the league. I really like the way you do your analysis. Keep up the good job! It would have been interesting to read, if the positioning of the defensive line was ok when Schalke scored their two goals. Surely they could have done better. But I want to know if their decisions were right at this moment. Tuchel said in his post-game interview that he completly agrees with the decisions of Mats in those situations. Both goals developed as counter attacks, so Dortmunds “defensive positioning” was not there even, it was more a question about the behavior in defensive transition situations. They were both high risk-high reward situations. If the pass before the first goal is not intercepted BVB has immediately outnumbered Schalke in a high position on the left side and probably a strong attack going. In the second situation Mats loses a crucial take-on in the midfield, that would shut down the counter attack immediately if he had won it. Papa then had the chance to defend anyway and made an individual mistake. Both of Mats “mistakes” were a result of Dortmunds intentional playstyle, which nets them many goals for the sake of the occasional goal against them. Thanks! Just one small thing: The guy’s name is Goretzka, not Goretxa.